What is dental marketing? There’s no doubt you have searched online for a business, and frankly most of your patients are doing the same thing. Consider your direct referrals are also reviewing your online reputation, searching for your practice, and visiting your website before calling you or visiting the office. It’s estimated that nearly 80% of all non-referral new patient leads in the dental industry begin with major online search engines, and the reality is that Google, Yahoo, and Bing have taken the place of the Yellow Page strategies of the past. With the explosion of mobile phones and their ease of accessing information at your fingertips if you’re not building your online brand, you are being overshadowed by your competition regardless if you’re the better dentist. Internet marketing for dentists is essential to growing your business, retaining patients and is critical to your overall success. For the same reason, I don’t recommend a patient performs a root canal it’s important to hire a professional marketing expert that knows precisely how to position your business online and drive results. Not only will this make the best use of your time, but you will see results and more patients much faster. Knowing some basics about internet dental marketing can go a long way regardless of if you hire a marketing professional or not. 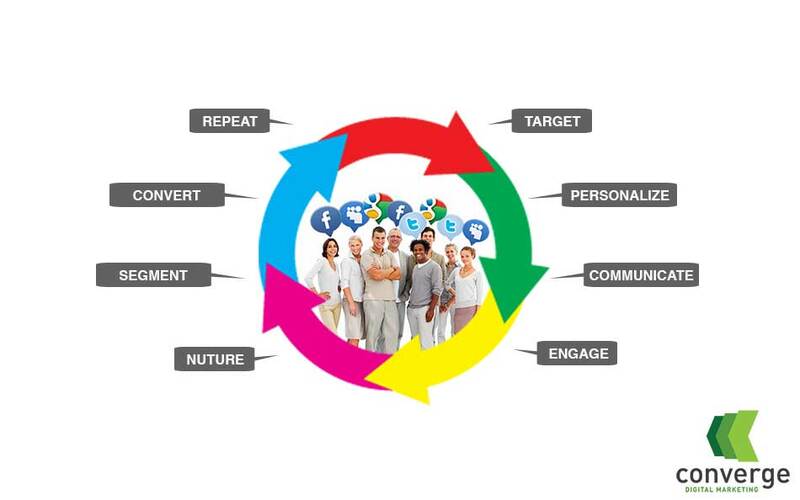 The go-to steps for successful internet marketing for dentists are as follows. You Must Have a Great Dental Website for Your Practice! Your patient’s first impression and the online marketing of your practice all start with your site. Patients will quickly navigate away from a webpage if they find it outdated, unattractive, slow, hard to use, poorly laid out or not mobile friendly. Your site should be informative, clear and easy to follow. When websites are designed well with user experience and conversion in mind, they will be laid out in such a way that patients can find the information they’re looking for and easily contact you. Check out a site we designed for one of our long-time dental clients below. We put a focus on beautiful design, but most importantly user experience and strong calls to action had to serve the visitors and our marketing goals. Note the Phone number and CTA for making an appointment (Our #1 marketing goal) placed at the top of the page and again book appointment in the main hero image. It’s important that these things appear above the fold, so the user doesn’t have to scroll to find them. Purposeful design should be your approach across your entire website to maximize converting leads into new patients and maintain an excellent user experience. You’ve probably heard the term, and you probably recognize your practice needs it. But, what is SEO? SEO is the acronym for Search Engine Optimization, and if you aren’t using it, you are losing patients to your competitors who are. Don’t worry, though. Despite your lack of SEO, there is still time to fix your situation and actions to ensure you are always top of mind (and top of the page) with your audience. But consider the longer you wait, the harder and more costly the job is. The overall goal is to create website authority. An authoritative site is promoted by search engines because it contains useful information about the user’s search. On page content and links back to it on places like social media, blogs, related keywords and consistently updated blog is picked up by search engines and are recorded as “authority signals.” Your website stands a higher chance of being placed above other sites because it is being updated and is informative to the user. SEO is a complicated process that helps get website traffic at a low patient acquisition cost from organic search and natural listings. SEO done properly is crucial to your site’s success and visibility of your practice in search results. 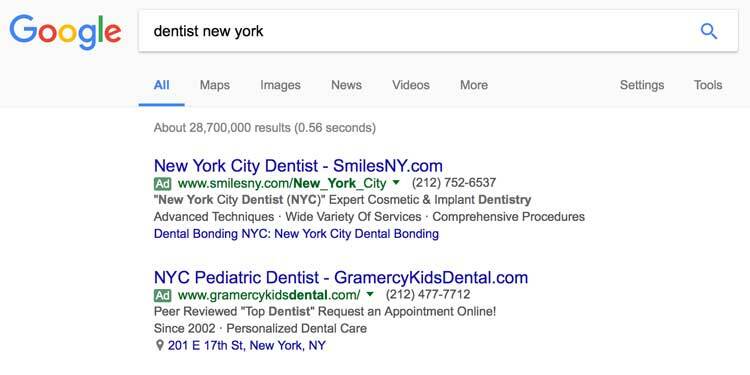 SEO for dentists that features a mix of long tail keyword terms like “dental implant expert near me” will convert on the page at a much higher rate than broader search terms like “dental implants” because long tail searches generally indicate the user is closer to making a purchase decision versus initial information seeking. 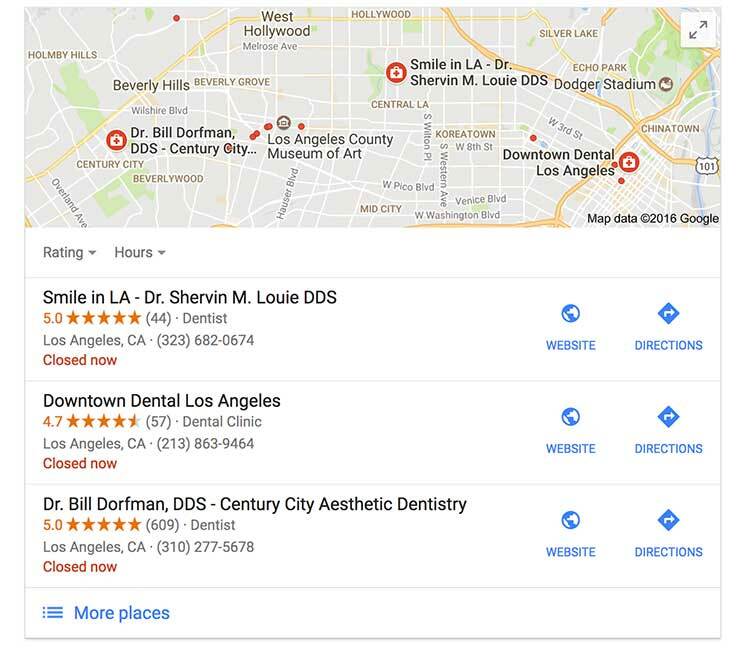 Being seen in Google Maps is critical to your practice, and Local SEO combined with Google Maps and Google My Business Optimization is the only way to ensure you show up in the coveted top three spots. Local SEO consists of optimizing your Website, Google My Business listings, and building authoritative citations centered around your location, so Google knows where your business is located and what services you offer potential customers. You simply must do more than your competitors to have any chance of showing in the top results on search or Google Maps results. I recommend that you hire a marketing professional to optimize your website. While many SEO companies offer a broad range of monthly costs and services, you get what you pay for, and I would steer clear of cheap SEO offers that are typically outsourced offshore, put your site at risk of search engine penalties and provide little long-term value to your practice. Encourage people to review your practice. Reviews help build your brand authority and patients trust which increase the chances of converting a website visitor to a long-time patient. A surprising 84% of users say that they trust online customer reviews and testimonials as much as personal recommendations. These referrals are your best opportunity to win the confidence of potential patients and contributes immensely to many factors that help your sites SEO. Your online reputation is ultimately what prospective patients see when they locate you on the web. What are people saying about your practice? By taking charge of your online reputation, it will inspire you and your staff to provide a better experience for patients. Use online sources like Google, Yelp, and your social media sites to get customer reviews that are authentic, and it will help people choose your practice. Don’t be afraid to ask your current patients for these reviews! Today, it is vital for you to have a strong presence on social media sites like Facebook, Twitter, Instagram, Pinterest, and Google+ in order to keep your practice top of mind for patients. A large percentage of your potential patients use these social media websites and so should you. Search engines like Google place a high value on your website’s relationship with social media and the more social engagement you have, the higher your site will rank in organic search results. But how do I make social media work for my dental practice? Social media is a fabulous way to gain more trust with your existing patients and start a relationship with potential new patients by sharing useful dental related blog posts, content and most importantly getting to know you and the personality of your practice. One of the most powerful methods of boosting traffic and capturing names for your mailing list from social media is with contests and giveaways customized to your business. Giveaways with prizes like a free in-office tooth whitening are great. PRO TIP: One contest idea we find works very well is doing a blog feature about one of your staff members that highlight who they are, likes interest and how what they do for your practice is important and impacts patients. Not only do the staff members LOVE being featured, but their family members and friends eagerly share the posts across social media. Heres where it gets powerful… A few days later, we do a promoted contest with a Facebook Paid Ad (it’s super cheap) and enter participants into a random drawing for whoever answered a question about the featured staff member accurately. Of course, they need to visit your website to read the staff profile to get the correct answers. People love it, and after you choose the winner, you have yet another post to share on social media about who won and what they won. All of this value from your initial blog post and posting it to social media. You can create and post related content that can be engaged and shared by a large number of people on social media but make sure to link your website in these posts. Apart from its tremendous impact, social media marketing is essentially free and will expand your reach. There are several platforms, but I recommend you start with Facebook and Twitter. For early success on these platforms target your existing patients and their friends and family. If you don’t have the time or staff to tackle social media, you can hire a professional to help do this work for you. We love building our clients social presence. Because social marketing is an excellent way to get your practice seen by a large number of potential patients, paying for ads on these sites can also be a winning strategy especially when using contests or promotions. Facebook ads offer a great way to target your potential market with laser precision and not only drive traffic to your website but help build your social media following at the same time. Great case study from Facebook’s ad platform featuring a dentist in South Carolina illustrating the power of Facebook social ads in the image below. You can also use Paid search to appear directly on major search engine’s results pages like Google. Finding the appropriate place for your practice will depend on a variety of factors. I suggest doing PPC in combination with other marketing efforts like SEO and Social Media to get the most from your budget. Truth is Paid Search ads for the dental industry are very competitive and have increased costs, but when done right they can net a great ROI. Practices that rely entirely on Pay Per Click Advertising will often burn through their budgets quickly due to the increased costs especially when not managed well. Retargeting also referred to as remarketing is when you visit a website an invisible cookie is placed on your browser which allows advertisers to serve up targeted relevant ads when you are on other sites like Facebook. Think about when you are browsing the internet, and you see ads for products or stores you may have visited in the past. It’s not a coincidence that’s the power of retargeting at work. When a user visits your site they have shown interest in your practice, and it is much easier to impress your brand further by placing your offer in front of them with an ad after they clicked away and increase the chances of them returning. If you’re serious about taking your dental practice to the next level, your long-term approach should be to diversify your traffic sources and make an investment in a combination of great web design, SEO, social media, and PPC. A well balanced and effective internet marketing strategy will include many of the points listed above, and you should implement all these tactics or hire a marketing professional that knows how to get the job done. THIS STUFF WORKS! If you tried these methods in the past and were unsuccessful, you probably hired someone who didn’t know what they were doing or maybe even tried doing it yourself and weren’t able to dedicate enough time to ensure success. If you have any questions or need assistance getting your practice growing with digital dental marketing, we can help. Contact Us Today!